I'm tired. Really tired. And I think it may have something to do with hubs kicking me repeatedly throughout the night. He was dreaming, apparently, that someone stole our car. Not sure why kicking was his first instinct. I woke him up once but he doesn't even remember. So I'm tired. And it's not even noon yet. LO is hilarious. She keeps calling me "mom" instead of mommy. And the same for "dad." It's quite funny to hear a 2-year-old say, "I want juice please, mom." Our list of potential properties to stay at for Chase's birth/surgery has dwindled down to TWO. And one of them is a BOAT! Okay, it's actually a yacht, but regardless, it's on water and hubs and I don't have a warm n' fuzzy about it. So I guess our potential property list is really down to ONE. I'm hoping and praying this is the one God has in mind for us. Otherwise, I don't know what we'll do. There are only so many 3 bedroom properties within a 5-10 minute drive to MUSC within our budget, so we're anxious to see how things look after we see the properties this weekend. I feel huge. I'll be 30 weeks on Sunday and I feel gargantuan. There's still 2 months more to go. Heartburn? It's ridiculous. I never had it until I was pregnant with LO. It was occasional but not a big deal. This time around, however, it is CONSTANT! Everything I eat AND drink cause it. I'm so over heartburn. Work got CRAZY this week. I supposedly work part-time, but due to the deadlines that were thrown on me 2 days ago, I now officially have about 5 business days to accomplish what should take me a little over 2 weeks. Guess I'm going full-time for a bit to get it all done. I hate that LO suffers, though. We can't go to the pool, the park, or anywhere else fun. I'm stuck at home with my laptop on my lap while she's stuck watching TV/DVDs all day long. I hate it!!! Girl, I think I can relate to everything on your list, except the "busy at work" part and having to property hunt. But the heartburn, check. Not sleeping well, check. Funny girls, check. 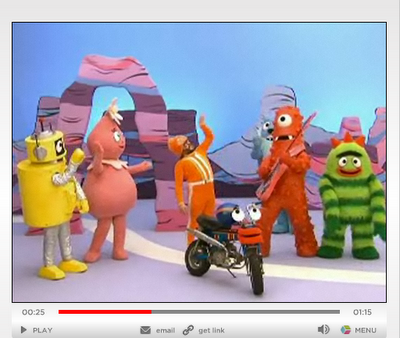 Definitely feel huge and Yo Gabba, Gabba.... my girls are completely obsessed!! Its all thats been playing in the car for the past month and they never get bored!! They act out ever song, although its precious, I too am worried about the long-term effects. I hope I get to see you guys soon!! I'm sorry to tell you guys Mary Grace still loves Yo Gabba Gabba! Maybe something less annoying will come along before they turn 4!